Posted February 1, 2017 by D2 Designs & filed under Promotions & Specials . Mention this ad and receive 50% off all banners. Full color, includes custom sizes. Up to 54″ height x any length. Basic design will be included. Posted November 11, 2014 by D2 Designs & filed under Promotions & Specials . 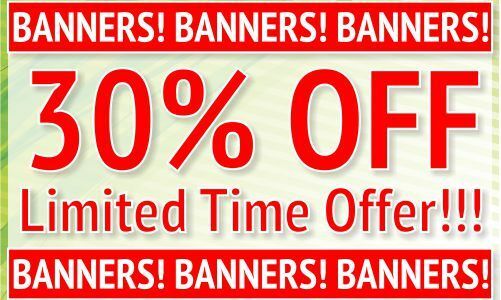 30% off all banners in November 2014. This is a Limited time offer. 1 hour of design is included. Full Color Banners!! Contact us TODAY to get started. Posted September 25, 2014 by D2 Designs & filed under Promotions & Specials . Posted April 1, 2014 by D2 Designs & filed under Promotions & Specials . Posted March 1, 2014 by D2 Designs & filed under Promotions & Specials . Posted January 1, 2014 by D2 Designs & filed under Promotions & Specials . Back by popular demand!!! We are pleased to announce our Pick Your Price! 3-Color T-shirt Special is back for the month of January 2014. 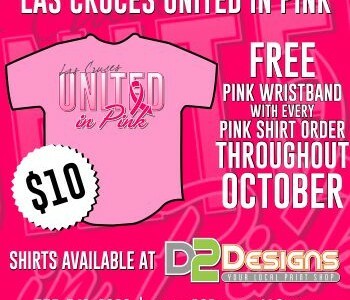 Any color t-shirt, $5, $6, $7, $8 or $9 dollars per shirt. Design is included and there are NO hidden set-up fees. Posted December 1, 2013 by D2 Designs & filed under Promotions & Specials . Posted August 25, 2013 by D2 Designs & filed under Promotions & Specials . Posted August 10, 2013 by D2 Designs & filed under Promotions & Specials . D2 Designs will include a full color 2.3ft x 5ft 13oz team support banner when you order your team’s uniforms through D2 Designs. Team support banner to include your team’s logo, your team’s sponsors (D2 being one of course) and any other information you want. Posted August 1, 2013 by D2 Designs & filed under Promotions & Specials . Pick Your Price! 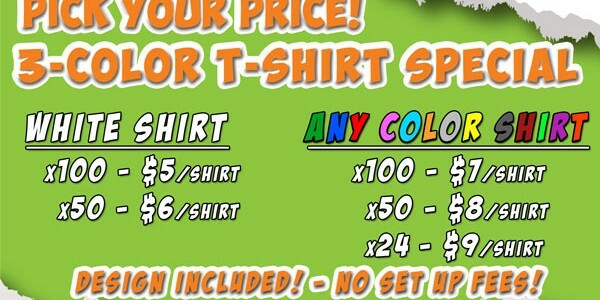 3-Color T-shirt Special, any color shirt, $5, $6, $7, or $8 per shirt. Design is included and there are NO hidden set-up fees.